Four yojanas on from this place to the east brought the travellers to the confluence of the five rivers. 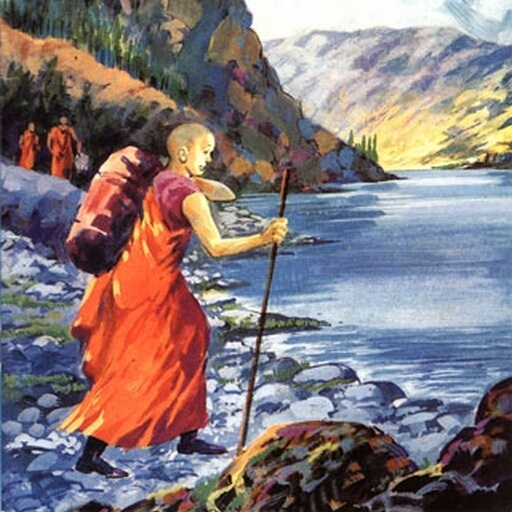 When Ananda was going from Magadha to Vaisali, wishing his parinirvana to take place (there), the devas informed king Ajatasatru of it, and the king immediately pursued him, in his own grand carriage, with a body of soldiers, and had reached the river. (On the other hand), the Lichchhavis of Vaisali had heard that Amanda was coming (to their city), and they on their part came to meet him. (In this way), they all arrived together at the river, and Ananda considered that, if he went forward, king Ajatasatru would be very angry, while, if he went back, the Lichchhavis would resent his conduct. He thereupon in the very middle of the river burnt his body in a fiery ecstasy of Samadhi, and his pari-nirvana was attained. He divided his body (also) into two, (leaving) the half of it on each bank; so that each of the two kings got one half as a (sacred) relic, and took it back (to his own capital), and there raised a tope over it.